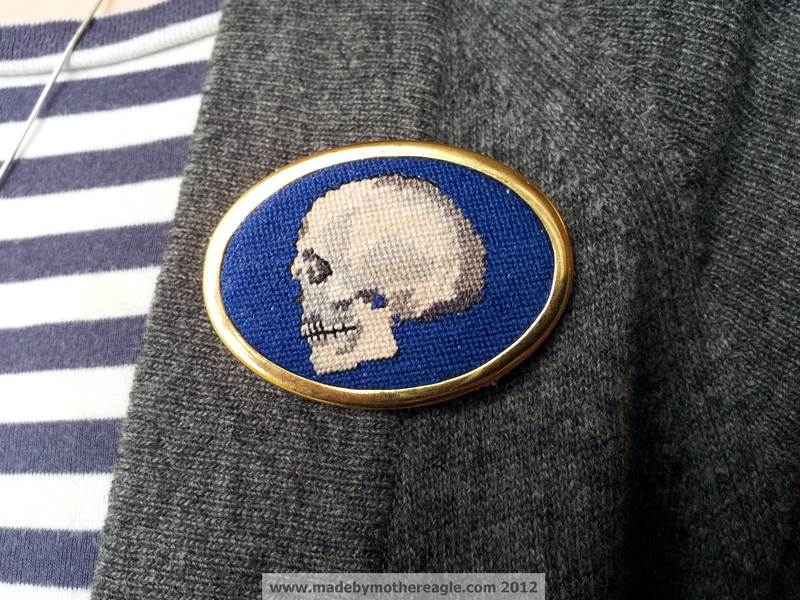 Just finished this morning…well, I was stitching the blue background until about midnight last night, then got up this morning and trimmed him and set him in the brooch. That was a tricksy affair I can tell you. Overall I like him, as a first attempt. He has over 1600 stitches afterall. Should have stitched the background before I did the outline to see what I REALLY needed to outline; I ended up covering some of the line with the blue because of this, which meant the canvas was getting pretty tight in places. i had to use 2 ply stranded cotton, as single strands didn’t give enough coverage. Blue was probably too dark a colour and not the best choice in a gold setting, in my opinion. Pattern still needs a little tweaking – it could do with some shading around the cheek and nose to give more depth. The worst thing about it was coming to set it – I’m thinking maybe canvas work isn’t the ideal thing to set this small, at least if I’m going to fill the background with stitches. The fabric ended up being very stiff and so having an overhang to tuck underneath the brooch plate wasn’t possible – I had to trim it reeeeeally close to the stitches which was frightening. But even so, the whole thing didn’t really come together as tightly, with as good a finish as I really need. It’s maybe that if I’m going to do counted canvas work in miniature for jewellery, then I need to buy it in colours and leave the background un-stitched so it is more flexible for mounting. Either that or I stick to freehand motifs. So, lessons learned, the next thing I’m doing this week is still in miniature, but in 40 count newcastle linen. My guru came over today and suggested washing the fabric first to soften it, so I have a dripping piece over my bathtub right now. What do you think? Do you like him? Wow Katie, he looks amazing. I can see what you mean about some of the detail blurring but that’s unavoidable when you miniaturise anything. Blue’s not my favourite colour but I think he looks fine. For me a darker colour might be cool, love a strong purple, maybe even a green, I’d be concerned that with a pale colour he might disappear into the background a bit. Coloured fabric to start with does help but obviously you are then restricted to what you can find, rather than choosing from your many thread colours. I guess it’s all experimentation which is half the fun anyway. Busy for the next few weeks but hoping to book in with you soon, maybe grab some lunch together too if you’ve time. That is bloody amazing! 1600 stitches is so many! That’s amazing skillz! I like the blue. I think blue and gold are nice together, so don’t worry too much about that! Basically you’re totally amazing and I’m WELL EXCITED TO BUY A PIECE. I’m going to build up the first Mother Eagle collection! Oh Lucy, you’re the shiznit. I like him! I like the blue too. 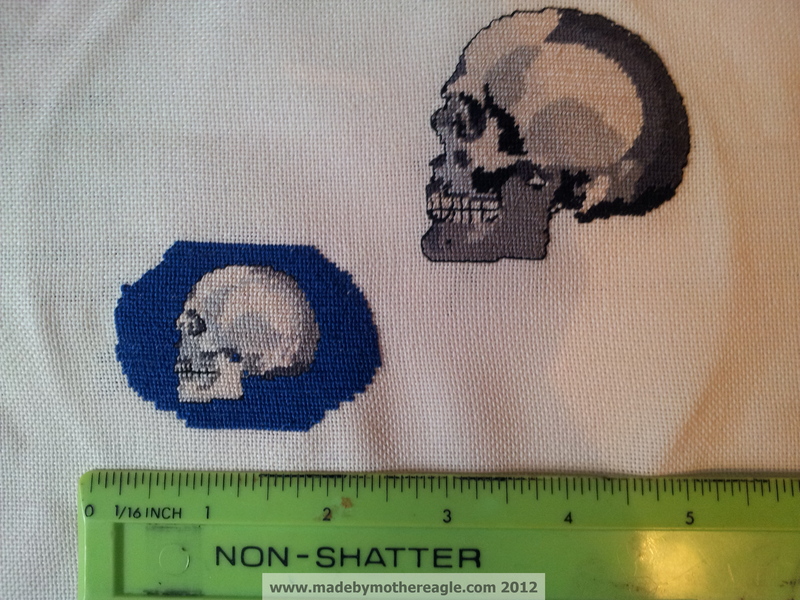 It’s an interesting contrast against the more sombre colours of the skull itself. I can appreciate how much work it took to create and capture him in the frame but he is delightful. You should be pleased with yourself and with him. 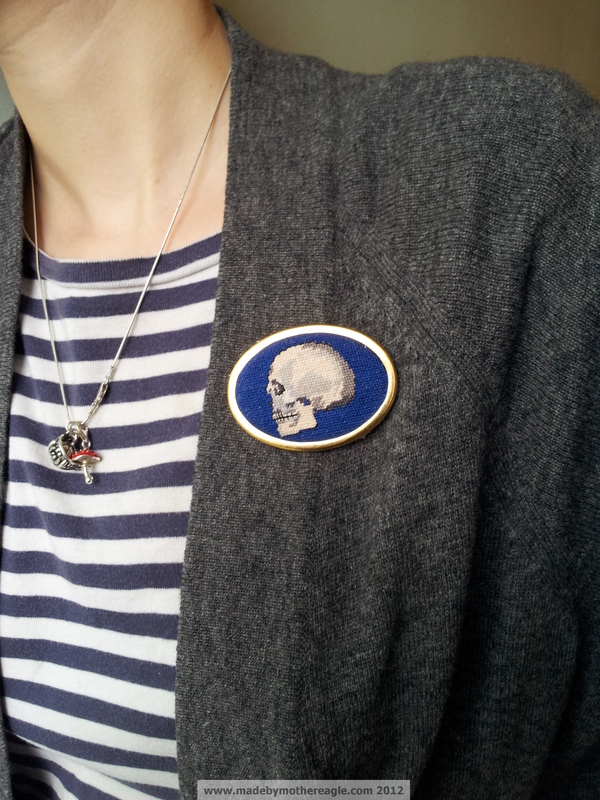 He’s lovely…can I say that about a skull? I like him very much. Thanks Carol! I do like him too…just critical of my work!